Essaouira is about two and a half hours from Marrakech (and Agadir). We have a longstanding relationship with a taxi company who offer a very reliable service at a reasonable cost. They can provide cars of different sizes for up to four, six or eight passengers (or sometimes twelve, depending on availability). If you choose this option, we will organise for the taxi to pick you up from the airport or anywhere else you choose (e.g. your hotel). The payment for the taxi is made directly to the driver at the end of your journey and we will be happy to provide you with costs before you book. It is also possible to get from Marrakech and Agadir to Essaouira by bus, the buses are relatively modern and good quality. The journey from Marrakech takes about three hours and our caretake Fouad will meet you from the bus on arrival. 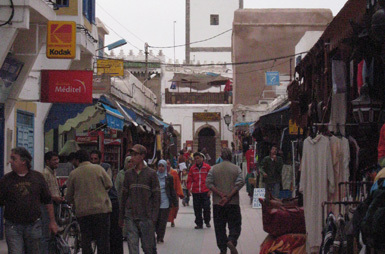 The buses go to and from the train station in Marrakech and just outside the medina in Essaouira. There is no train station in Essaouira. Cars can be hired from Marrakech (e.g. the airport) or Essaouira new town. Once you make a booking, we can send you lots more detailed information about travel options and will be happy to answer any questions.